The literature on the interaction between socioeconomic status and IQ heritability is very mixed. Several studies besides Turkheimer’s find such interaction (although in no other study is it as extreme as in Turkheimer et al. 2003), but others, including some with the very best study designs, find none. I am not going to try to adjudicate between these contradictory findings at this time. Rather, I will show some interesting, hitherto unpublished (well, careful readers of Boetel and Fuerst’s The Nature of Race have seen them already) results pertaining to Turkheimer’s study and the question of race differences. It is quite natural to assume that Turkheimer’s study was indeed about interaction between race and heritability. The twin sample used, recruited between 1959 and 1965 for the National Collaborative Perinatal Project (NCPP), was 43% white and 54% black. The inevitable inference is that as heritability is zero in poor families, and blacks are disproportionately poor, genes can hardly have anything to do with the lower mean IQ of blacks. As can be seen, point estimates are similar across races, and confidence intervals are mostly overlapping. Despite the strong SES-heritability interaction, there is no race-heritability interaction in this sample. The sample of 7-year-olds used by Beaver et al. was somewhat different from that of Turkheimer et al., because the former included also non-twin siblings and half-siblings in their analysis. Moreover, estimation in Beaver et al. was based on maximum likelihood with robust standard errors, which resulted in wide CIs despite large Ns. However, we have a confirmation that heritability and environmentality estimates did not differ significantly by race in the analysis by Turkheimer et al., either (Eric Turkheimer, personal communication, October 4, 2013; he did not have precise estimates at hand, though). 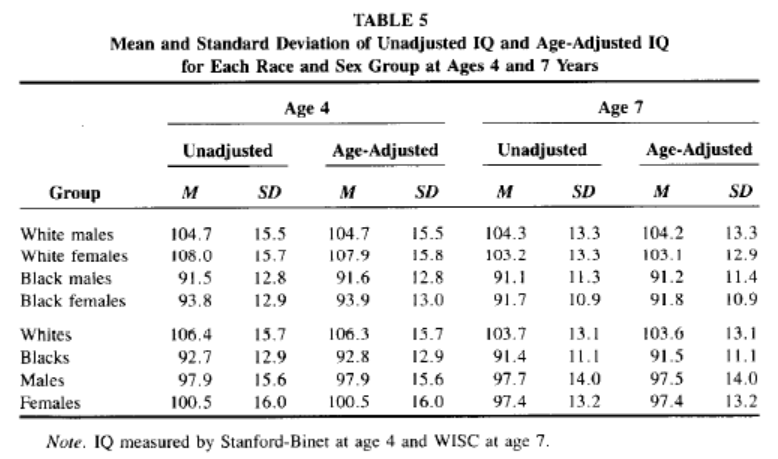 The upshot is that while environmental deprivation may render genetic differences less important in the determination of children’s IQ, the typical black child in this large and downscale sample had apparently not been raised in deprived circumstances any more frequently than the typical white child in the sample. The lower IQs of blacks in this sample cannot therefore be put down to them having been exposed to environments less conducive to the expression of genetic variance in IQ than the environments experienced by whites. Had the race-specific results been published by Turkheimer et al. back in 2003, we would have been spared much misleading speculation. But perhaps Turkheimer had his own reasons for withholding this information. But we still know that in the national population black poverty rates are higher, and education is lower. So that would just mean that the study sample was unrepresentative or underpowered to detect that effect (you note the huge confidence intervals). What was that IQ gap? Was it smaller than in samples with more representative poverty rates for black households? The Collaborative Perinatal Project (CPP) enrolled pregnant women at 12 academic medical centers in the United States in a nationwide cohort between 1959 and 1965. Women were enrolled at their first prenatal visit and were followed during pregnancy, labor, and delivery. The offspring were followed for 7 yr, with multiple questionnaires regarding medical and social history and detailed neuropsychological testing at 4 and 8 mo and 1, 3, 4, and 7 yr of age. Of the 29,710 mothers who were included in this analysis, 14,171 were black and 15,539 were white. Overall, black mothers were younger (24 versus 25 yr), were heavier (prepregnancy BMI 23.3 versus 22.4), and had fewer years of education (10.3 versus 11.4 yr) than their white peers. They also were less likely to smoke (40.5 versus 52.3%), more likely to be anemic (22.9 versus 6.9%), and more likely to live in poverty (72 versus 39%). Beaver et al. used all sibling pairs (although only one pair per family) and Turkheimer et al. used all twin pairs from those data, so mothers’ characteristics should be similar to the full data set. Blacks were born to mothers with less education and a higher rate of poverty than whites, and the average levels of education were lower than the national averages for both black and white mothers. The sample was indeed unrepresentative in the sense that the blacks mothers in particular were poorer and less educated than the general population, but this should have made it easier to find race-ACE interactions. underpowered to detect that effect (you note the huge confidence intervals). The huge CIs are really an artifact of the robust standard errors that Beaver et al. perhaps needlessly used. The sample sizes were rather large, so the CIs would have been very small otherwise. Morever, the lower bounds of the black CIs for h^2 were 0.29 at age 4 and 0.36 at age 7, that is, nowhere near zero and not greatly different from heritabilities usually seen at that age in whites. It is a paradox that there was SES-h^2 interaction but no race-h^2 interaction, even though blacks had lower SES. As to why this was the case, I can only come up with highly speculative explanations. Then again, the black-white SES difference (either in this sample or in the general population) was (and is) not that great, so we would not expect lots of interaction in any case. The point is that there is no evidence for lower genetic variance in IQ for blacks, even though several environmental theories of the IQ gap predict that heritability must be much lower in blacks. So does that mean the 28% of blacks not living in poverty collectively had roughly as much genetic variance as the 61% of whites not living in poverty, with much higher per capita genetic variance? I would like to read them. But this seems to indicate a big hole in understanding, which should add some doubt to claims that might connect to it. 1) Being black is negatively correlated with IQ mean and variance as well as SES. The strong SES-h^2 interaction found by Turkheimer et al. could be an artifact caused by their decision to analyze blacks and whites together as a single sample. 2) Perhaps blacks are naturally more resilient in bad environments. Thus the same bad environment would be worse for white than black cognitive development, which would explain why black h^2 is not lower despite the SES-h^2 interaction. 3) IQ scores may begin to suffer from measurement non-invariance in whites at less severe levels of deprivation than in blacks. This could happen if poor whites are more isolated from the mainstream culture than poor blacks, causing measurement non-invariance and (perhaps artifactual) reductions in h^2. This is probably a false explanation though as poor whites outscore poor and even well-to-do blacks. If this is true, shouldn’t environmental interventions to boost cognitive ability show greater gains for poor whites than poor blacks? My knowledge of the literature is cursory, though I know of this Head Start study which seems to show that this is the case in regards to PPVT scores. Or it would mean that the causal arrow runs in the opposite direction; IQ gaps –> SES gaps. 1 SD in this sample. Impoverished blacks were over-represented in this sample. What were the IQ means and variances by race? The fact that the means are nominally above average reflects the Flynn effect and outdated norms. The sample is almost certainly below average in IQ for both races. Thanks. Now, has anybody graphed a scatterplot of pairs of with the first twin’s IQ on one axis and the other twin’s IQ on the other axis? You can use color of point to distinguish race and shape to indicate SES status. Are we seeing a lot of pairs of poor black twins where one twin has a quite high IQ and the other has a low IQ? That’s what most of the journalism about Turkheimer’s article implies, but I bet that if anybody plotted this graph we wouldn’t see many examples of this. However, I cannot see anywhere in the Turkheimer article where that is discussed at all. It seem from a cursory scan of the Turkheimer article that they compared MZ to DZ twins. In fact Turkheimer et al. performed statistical analysis based on race, education, and income individually…. AND REPORTED not finding any statistical significance in these samples. why don’t you read the article again? That’s incorrect. There was no analysis of whether race interacts with ACE components in the focal sample in Turkheimer et al. 2003. There is currently no reason at all to think that any significant portion of the IQ differences among socially defined racial groups is genetic in origin. …The heritability of intelligence, although never zero, is markedly lower among American children raised in poverty. Several interpretations of this fact are possible. The one we find most persuasive is that children raised in those circumstances are unable to take full advantage of their genetic potential because they do not have access to the high-quality environments that could support it. If you disagree, explain how pondering on findings of Turkheimer et al. — if interpreted as indicating no race x h2 interaction and if interpreted in light of the environmental disadvantage hypothesis/bio-ecological model as Turkheimer does — is supposed to undercut support for a genetic hypothesis? After all, Scarr’s environmental disadvantage hypothesis, cited in Turkheimer et al., makes the explicit prediction that heritabilities will be depressed in the environmentally disadvantaged group — and this prediction is precisely what Turkheimer et al.’s unreported results contradict.